Halloween is a time of costume envy, candy gluttony, and greed, capped off with intense sloth. But why should kids be the only ones who ride the stimulant-depressant rollercoaster? Here’s a guide to beers to drink with the secret stash hidden in your umbrella stand. You don’t have to do what my assistants (wife and uncle) and I did for this experiment, which was gorge ourselves on bags of candy while sipping beer. You’d get sick. But that’s how you get the data. Our hypothesis: tart will go with bitter beers and sweet will go with malty, coffee-like beers. This turned out to be narrow-minded. Imagine a lab table littered with brightly colored plastic packaging that concealed thousands of artificial sugar treats. From tartest to mellowest, we sampled Nerds (strawberry and grape), Sweet Tarts and Bottle Caps. From mellowest to sweetest, we tried Whoppers, Kit Kats, mini-Hershey’s bars and Reese’s Peanut Butter Cups. Now picture, next to all of that candy, three tiny beakers filled to the brim with frothing, tan ale. Our beers went from dry with a little bitterness in a lager to balanced bitter-to-sweet ratio with a brown ale. We sampled a high-alcohol Scottish ale, and went in opposite directions with a syrupy coffee-like porter, then a mildly tart cherry lambic. The bitterness of the Nerds was overly aggressive and overpowered the strong beers, reducing them to watery versions of their former selves. The trick to appreciating a tiny box of gravel candy is to pair it with a quiet beer like a lager. Surprisingly, the Sweet Tarts did fit in nicely with our porter, resulting in a cherry cordial effect. The Bottle Caps, which feature a root beer tang, were tough to pair. They came alive best with the beer that also resisted easy pairing, which was our Scottish ale. This style usually features a caramel flavor with a hint of smokiness. Something about the root beer complemented the sweetness in the ale. Predictably, the wafer in Kit Kats and Whoppers was a big hit with almost every beer we tried, especially the balanced brown ale and porter. Also, no surprise: Hershey’s fit the porter like a chocolate glove. However, it was a shock to taste how versatile the cherry lambic was. Lambics are fairly dry with a tart kick and are rather elegant in their own way. Ours had no business slumming it with these cavity rockets. But they mellowed the lime Sweet Tarts and turned the Reese’s into a peanut butter and jelly sandwich. This was not at all an exhaustive search for sugar-beer nirvana. For example, we left out super bitter beers like India pale ales. Feel free to try that on your own and share the results at beer.snob@yahoo.com. This column was originally published on Oct. 23, 2013, in the Waterbury (Conn.) Republican-American. 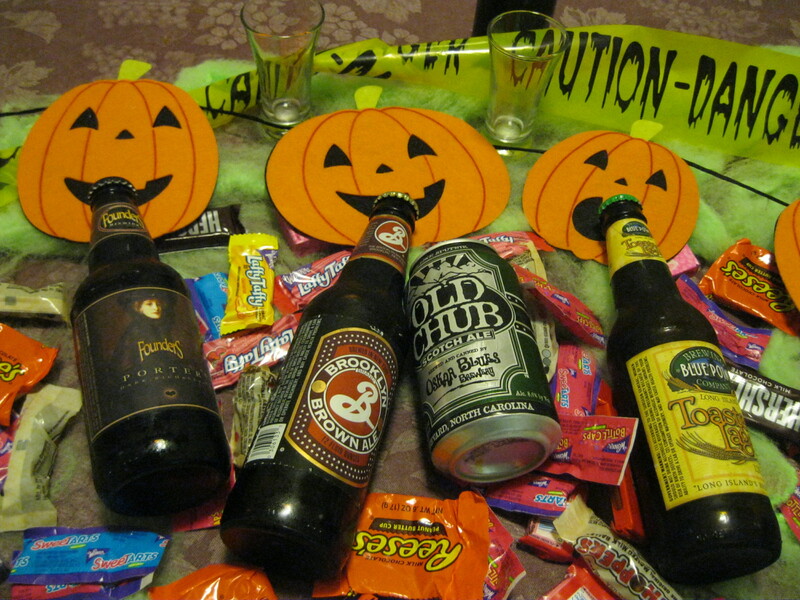 This entry was posted in Beer Snob and tagged Brooklyn Brewery, candy, Founders Brewing, Oscar Blues. Bookmark the permalink. ← Elk and rabbit and duck: Oh yeah!